a deposit of calcium in the skin; usually occurs secondary to a preexisting inflammatory, degenerative, or neoplastic dermatosis, and is frequently seen in scleroderma. See: metastatic calcification. A condition characterised by circumscribed subcutaneous deposition of calcium, which may occur in a background of chronic inflammation, e.g., in connective tissue diseases, including scleroderma and systemic lupus eythematosus. Intralesional steroid injection; etidronate disodium, a diphosphonate, may inhibit biomineralisation; surgery is of questionable efficacy. Georges Charles, French physician, 1873–. a condition characterized by abnormal deposition of calcium salts in the tissues. localized deposition of calcium in small nodules in subcutaneous tissues, tongue or attached to tendons or joint capsules. Called also tumoral calcinosis. 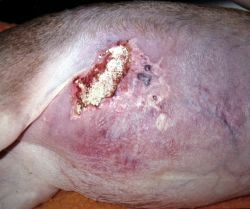 cutaneous mineralization, a characteristic lesion in dogs with hyperadrenocorticism. Lesions are commonest on the dorsal midline, ventral abdomen and inguinal region. The skin is usually thin and atrophic. Calcinosis cutis in a dog with Cushing's syndrome. calcinosis occurring in larger numbers of animals in a local population than chance warrants. Usually a plant poisoning. May be caused by the following calcinogenic plants: solanummalacoxylon, S. linneanum,cestrumdiurnum,nierembergia veitchii and trisetum flavescens. Manifested clinically by chronic wasting, reluctance to walk and constant shifting of weight from limb to limb. Called also enteque seco. described in Hungarian vizsla dogs in association with a renal tubular defect in phosphorus transport, causing progressive lameness. circumscribed, hard swellings with a granular radiopacity, usually immovable and located in horses on the lateral aspect of the proximal tibia. widespread deposition of calcium in nodules or plaques in the dermis, panniculus and muscles. Calcinosis cutis of the fingertip associated with Raynaud's phenomenon. Calcinosis cutis in autoimmune connective tissue diseases. Calcinosis cutis following extravasation of calcium chloride. Erythematous plaque with yellowish papules on the shin: was the eruption on our patient's leg related to the treatment he received during his hospitalization? Metastatic calcinosis cutis with transepidermal elimination. We describe the case of a 21-year-old woman presenting with calcinosis cutis universalis, 6 years after being diagnosed with SLE. A diagnosis of calcifying panniculitis owing to SLE was considered, but a skin biopsy showed no significant inflammatory infiltrate; a final diagnosis of calcinosis cutis universalis associated with SLE was made. Calcinosis cutis may involve a localised region, in which case it is referred to as calcinosis cutis circumscripta and, in its more generalised form, as calcinosis cutis universalis. Calcinosis cutis has been described as severe, damaging, (6) disfiguring and painful. Alabaz D, Mungan N, Turgut M, Dalay C: Unusual Idiopathic Calcinosis Cutis Universalis in a Child. Valdatta L, Buoro M, Thione A, et al: Idiopathic circumscripta calcinosis cutis of the knee. Guermazi A, Grigoryan M, Cordoliani F, Kerob D: Unusually diffuse idiopathic calcinosis cutis.